Gag99 is the latest addition to our blogger template collection. It is a free responsive blogger template which will help you to showcase videos or images in the best way. It will automatically show a thumbnail image or video in home page. It is a responsive blogger template making using of bootstrap 3 grid. Code for html widget. Replace Featured with your own label. This code if need to showcase recent posts. var norelatedpoststitle = " No related posts"
Please find the above code in blogger template to make your own template. Change value weblogtemplates under twitaccount to change your twitter via account and twithash to change hashtag that you can append to each tweet from your blog. Change number of related posts using maxresults and Heading using relatedpoststitle. 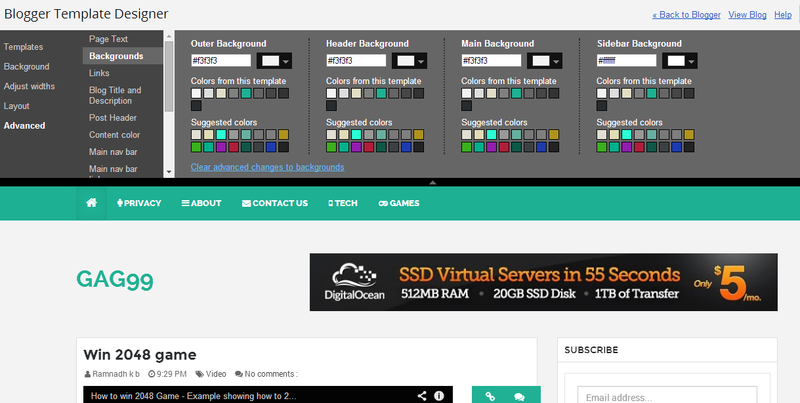 Everyone can easily change code inside menu by searching and editing links inside this HTML5 nav tags. Thanks for using our templates. How show summary in home or labels page with this template? Right now this template don have such feature. what about changing the miage on the navbar menu, how?